Surfing and sign language may not seem like the most obvious combination. 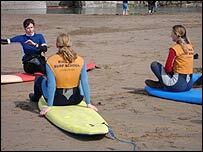 But one South West surfing coach is pioneering the teaching of the popular water sport to deaf people. Becky Price, who qualified as a surf coach in 2001, was already fluent in French and Italian and decided to learn sign language as her next challenge. She now offers lessons in sign language at the Big Blue Surf School based in Bude which she runs with husband Jon. She qualified as a surf coach in 2001 following a move to the South West after meeting Jon, 32, when he taught her how to surf. "I always had a personal interest in learning sign language. I work as an interpreter and sign language is just that, another language." Becky, 33, has completed year 1 of an NVQ3 in British Sign Language (BSL) and is now a Level 2 BSL signer. And after meeting some deaf people locally she started to offer one-to-one lessons to see how it would work. The idea of using signing in surfing is not completely alien, there are already internationally recognised hand signals for surfers, for example to indicate when they are in distress. "It's a natural progression really," she says. Lydia Docker, from London, recently attended a course at Bude after seeing Becky's advert on the UK Deaf Sport website. She said: "She taught us how to surf in sign language which was so amazing . "I have learned a lot, ten times more than with a hearing instructor. "I felt comfortable asking Becky questions about surfing. I would not have done it with a hearing instructor because of communication breakdown." Teaching people who lip read or use sign language presents its own particular challenges and Becky reduces the class-to-coach ratio. The dry land part of the lesson also tends to last slightly longer and be more detailed. Hearing aids can be kept on whilst having the lesson on the beach and stored safely in waterproof bags on the beach when students are in the water. But once the group takes to the waves the teaching follows the usual pattern. "There has to be a bit more thinking ahead but it's pretty much like any other lesson." Becky has also had to invent some signs specifically tailored to surfing. "I've created signs for the leash and for the rails of the board and they seem to work." Becky has plans to promote the facilities the surf school offers to the wider deaf community and is delighted with the response she has had from students so far. "I really enjoy using sign language, it's stimulating and challenging," she said. "As far I know the deaf community hasn't had such tailored access to surfing before. "The surfing industry is worth millions to this area and it's great to be involved in something so pioneering in the South West." For her part Lydia is already planning a return visit to the county to continue improving her surfing skills. "I'm going to come back to Cornwall with friends to learn more with Becky. I really enjoyed it," she said.